Way back in the beginning of January I sent Tillamook an email in hopes they’d want to work on a project together. They were super kind in their response and let me know about their “Love Loaf Tour” happening this summer and wanted to know if I’d work on something around that time. Score! I love Tillamook, have taken the fun factory tour complete with a cheese sample at the end, and now I get to blog with them! I assumed I’d be working with cheese but I got an email not too long again that said they’d like to send me coupons for ice cream instead. No complaints here. So here’s some info on ice cream and their Love Loaf Tour. This past week has been a fun and crazy one. My parents came and went home to Kentucky, Husband went to Virginia and back for a business trip, my little brother moved in with us, and I found out the gender of the baby! By the time the weekend rolled around we were in need of a chance to unwind and celebrate a week well lived. I invited some of our favorite people over for a nacho party and then topped it all off with Tillamook ice cream. The ice cream is so rich and creamy with fun flavors (Marionberry Pie ice cream anyone?!) that I didn’t even feel like I needed brownies or toppings to go with it. The Tillamook ice cream can stand on its own as a dessert which made my life easy. The kiddos loved the stuff. Can you tell?! I make homemade ice cream about once a week. We adore ice cream. I rarely buy it through because so often the list of ingredients is a mile long. Not true with Tillamook. They use things like cream, sugar, dutch cocoa, and real caramel. I like when I know what all of the words in the ingredients list are! I know it sounds simple but the more you look the more you’ll realize that normal ingredients aren’t “normal” in most commercially produced products. I warned Tillamook that I have a big family and we like to eat, so they really hooked me up. We tried Vanilla Bean, Marionberry Pie, Rocky Road, Chocolate, Oregon Strawberry, and Caramel Toffee Crunch. The Marionberry Pie was so unique and fabulous and the kids couldn’t get enough of the Strawberry. I liked the Rocky Road the best because the chocolate ice cream base was outstanding. Here’s husband balancing most of the cartons on the way back to the freezer. We invited over some of our favorite family members who loved the ice cream buffet after dinner. Do you think this face could lie? The next day that kiddos remembered we had a stash of ice cream goodness in the freezer and begged to have some after church. I couldn’t say no; I wanted some too. Mini cones it is! A big thanks to Tillamook for letting me enjoy so much ice cream. I totally recommend it. Now on to the part I said I do for them… let you all know about their Love Loaf Tour. 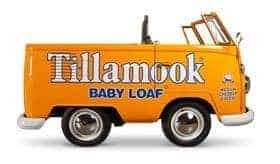 So Tillamook has a cool campaign where they are sending out these adorable little vehicles across the country who are make stops all over and giving out free samples, product, treasures (everyone loves a button! ), and coupons. I know I’m not alone in my Tillamook love. I had to drive the ice cream home in a cooler with ice because it was 107 degrees the day I picked it up in town (an hour and a half away) and I instagrammed a picture of the cooler full of ice cream treasure. So many people said how much they loved it! 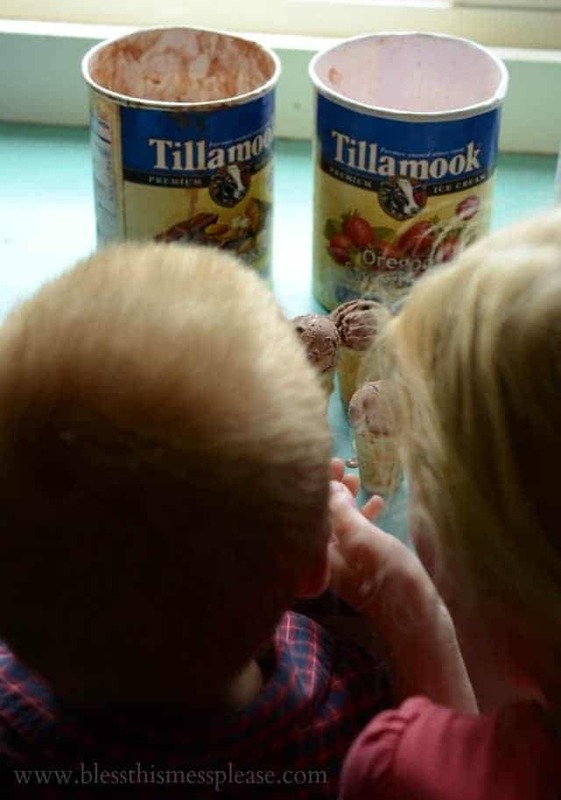 So what is your favorite Tillamook product or ice cream flavor?! Thanks so much for letting me share the love. No, that face couldn’t lie 🙂 It should be in an ad! Love Love Love Tillamook ice cream. It really is the best. Caramel Pecan is absolutely wonderful, so much better than any other brand it should have its own name! But all their flavors are great from Rocky Road to Peppermint Candy. 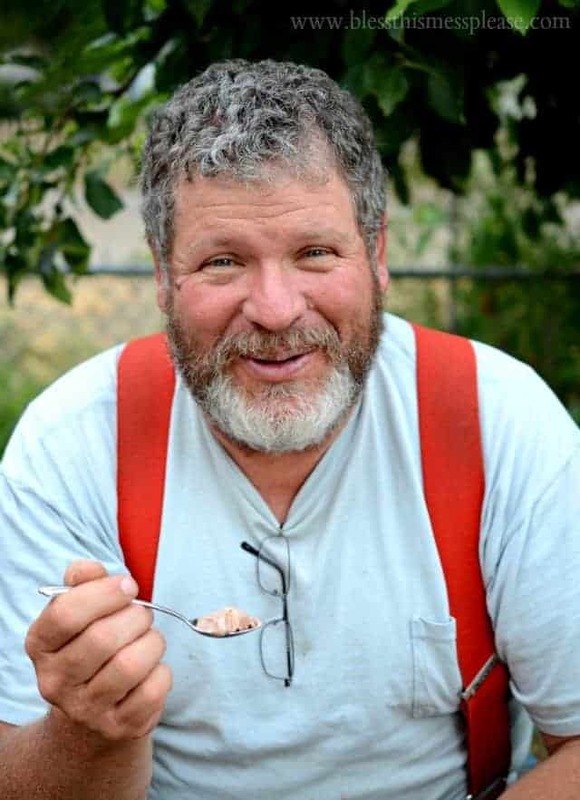 I’ll have to try Tillamook ice cream. Yum! 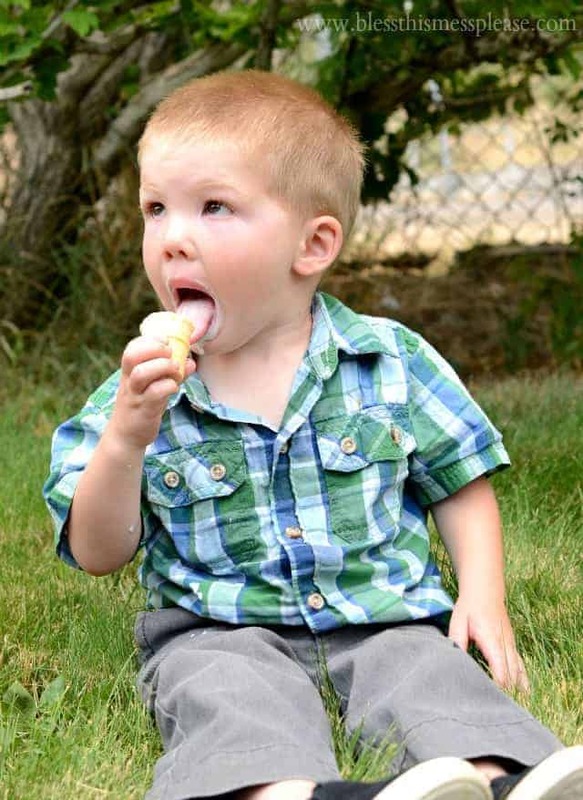 PS-the pics of your little boy and the other family member are awesome. Great work!